Deaths from accidental overdoses increased in Texas by more than 150 percent from 1999 to 2007, according to a recent report from the Drug Policy Alliance. Accidental poisoning during that time was the third-leading cause of injury-related deaths statewide, behind only car crashes and suicide. 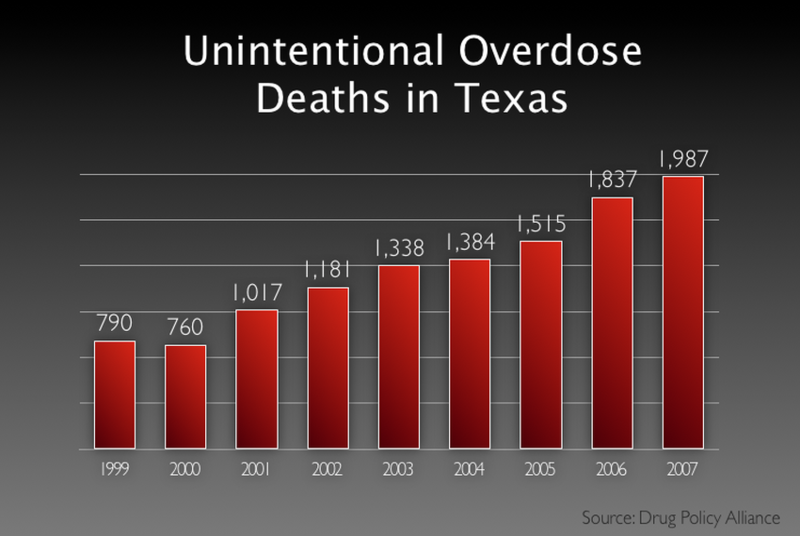 The number of deaths by accidental drug overdose in Texas is rising at an alarming rate. But many of the victims aren't your typical addicts: They're average people hooked on legal prescription drugs. “The majority are people with homes and families and jobs and, you know, just you or me,” says Mary Beck, chief services and evaluation officer at the Council on Alcohol and Drugs Houston. Deaths from accidental overdoses increased in the state by more than 150 percent from 1999 to 2007, from 790 to 1,987, according to a recent report from the Drug Policy Alliance, a New York-based drug policy think tank. Accidental poisoning during that time was the third-leading cause of injury-related deaths statewide, behind only car crashes and suicide. “Texas is sort of like a microcosm for something happening all over the United States,” says Meghan Ralston, the Alliance's harm reduction coordinator. The group’s research shows that both in Texas and nationally, legal prescription drugs like oxycodone, hydrocodone and Xanax contributed to more overdose deaths than illicit drugs. “Heroin, crack, powder cocaine — all those combined don’t even amount to the number of prescription opioid deaths nationally,” Ralston says. The problem is particularly pronounced in Houston, where prescription drugs were identified in half of all accidental overdose deaths from 2005 to 2009, according to the report. Beck says the number of calls to the Council about prescription drug abuse is greater in recent years. Among the problems she often sees is what she calls a prescription “cocktail” of Xanax, Vicodin and Soma. The drugs are often prescribed together when a person experiences trauma like a serious car accident: Vicodin for pain, Xanax for anxiety, Soma to relax painful muscles. The trouble, Beck says, comes when patients aren’t educated about how to appropriately take the medications in combination. “What all too often happens is it feels good, so they take more ... and eventually develop an addiction,” she says. Angela Vickrey, director of admissions at Austin Recovery, a drug rehabilitation and alcohol treatment center, confirms the trend. For many people, she says, what begins as legitimate pain management quickly develops into a physical addiction. It’s not a matter of the addict having lax morals or a weak constitution, she says; pain medication physically alters the brain. When someone stops taking the pills, they can experience anxiety attacks, seizures, uncontrollable bowels and severe muscle pain. “It’s pretty excruciating,” Vickrey says. To avoid painful withdrawal symptoms, she says, some patients turn to heroin when doctors stop writing prescriptions or when the pills become too expensive. State lawmakers have taken some measures to address the increase in accidental overdoses. In 2009, state Sen. Tommy Williams, R-The Woodlands, passed a bill that took aim at so-called pill mills — pain management clinics that prescribe medication to addicts without proof of a real medical need. The bill allows for regulation and investigation of such clinics and, starting in September of this year, required them to be state certified. But Ralston says Texas policymakers can do more to prevent prescription drug deaths. “Prescription opioid drugs actually do have an antidote available,” Ralston says. “It works immediately, it’s been around for 40 years and it has virtually no side effects.” Policymakers in Texas and across the nation, she says, should provide for increased access to and education about naloxone, usually marketed as Narcan, a prescription drug designed to reverse the effects of overdose from drugs like heroin, OxyContin, Vicodin and other opiates. “It’s truly a miracle drug — it literally saves lives,” Ralston says. Texas lawmakers, she says, could also help prevent overdose deaths by passing so-called Good Samaritan laws that exempt people from arrest for small amounts of drugs if they call for help when another person is overdosing. New Mexico adopted such a law in 2007, and Washington state did so in 2009. “If the climate in Texas allowed someone do the right thing, it could help save a life,” Ralston says. Jane Maxwell, a senior researcher at the University of Texas Center for Excellence in Drug Epidemiology, says the Drug Policy Alliance research data may exaggerate the overdose death numbers because the group included all accidental poisonings, which could include a baby taking a pill found on the floor or someone taking a drug by mistake. “Accidental poisonings include a lot more than people intending to get high and ending up dead,” Maxwell says. But she agrees that prescription drug addiction in Texas is a growing problem and that state lawmakers could do more to prevent deaths. Lawmakers, she says, should devote more funds to the Texas Prescription Program to make prescription data available in real time to doctors and to pay for more than just one investigator to go after alleged pill mills.